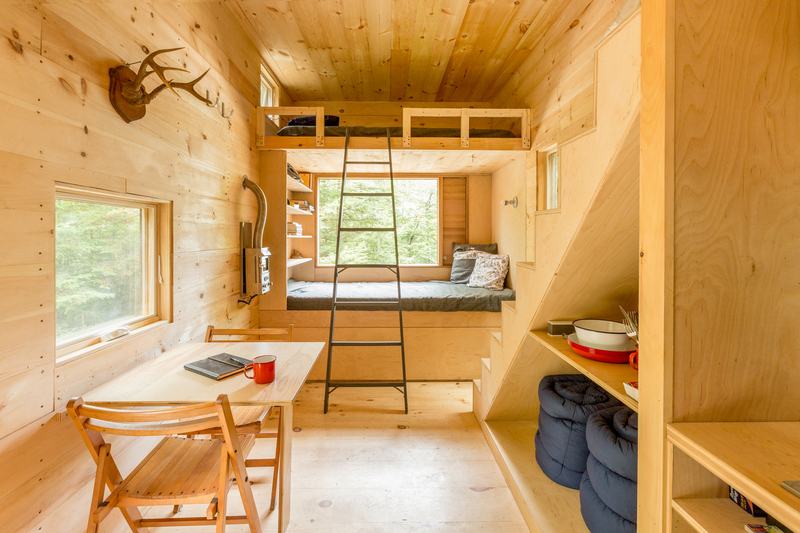 Anyone who feels burdened by a mortgage and too many belongings, can’t afford a conventional home or dreams of living on the road has likely gotten caught up in the tiny house movement at one point or another, but actually downsizing to that degree can be kind of scary. It’s true that you have to live a relatively minimalist lifestyle to pull it off, shedding all the stuff you don’t actually use on a regular basis. But even once you manage to pare down, what’s it like to wake up in one of those shed-sized structures every morning? Would you have enough room to cook, work, entertain guests or even relax, especially if you’re cooped up for a while during less-than-stellar weather? Would you feel claustrophobic? 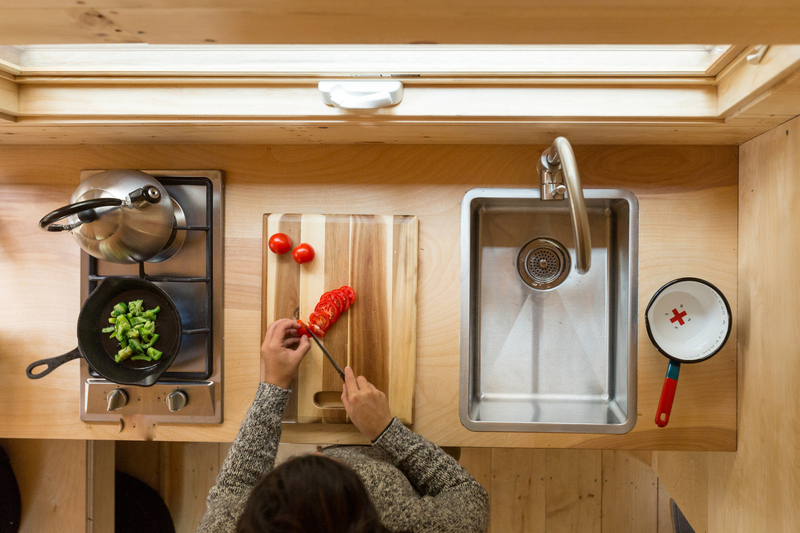 These are all fair questions – and great reasons to take a tiny house on a test drive, so to speak. 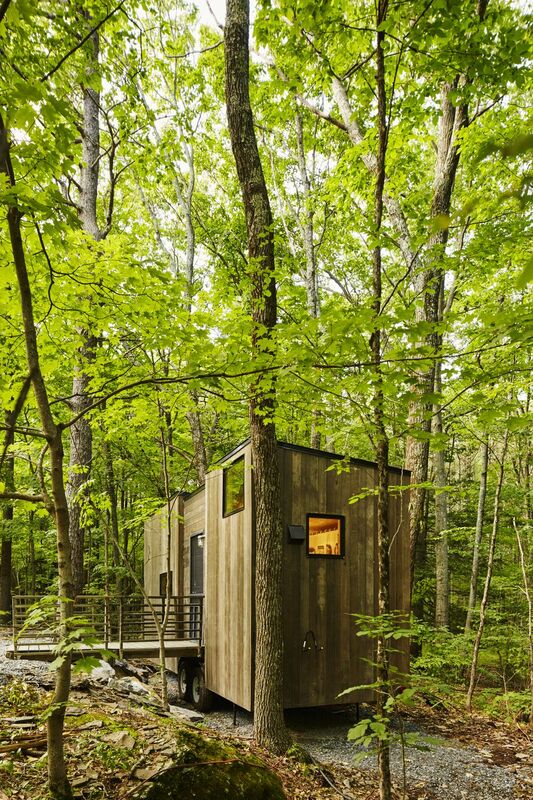 If you live in New York or Massachusetts, you can do just that via Getaway, a startup that rents out gorgeous cabin-style tiny house in the woods outside the big cities. The company launched in Boston in 2015 with three models and recently expanded to New York City, offering a rural vacation experience that’s not too far from home. Dreamed up by Harvard Graduate School of Design student Emily Margulies, the three New York houses are named Maisie, Eleanor and Isidore, with the latter offering a wide ramp entrance for enhanced accessibility, and start at just $99 per night. 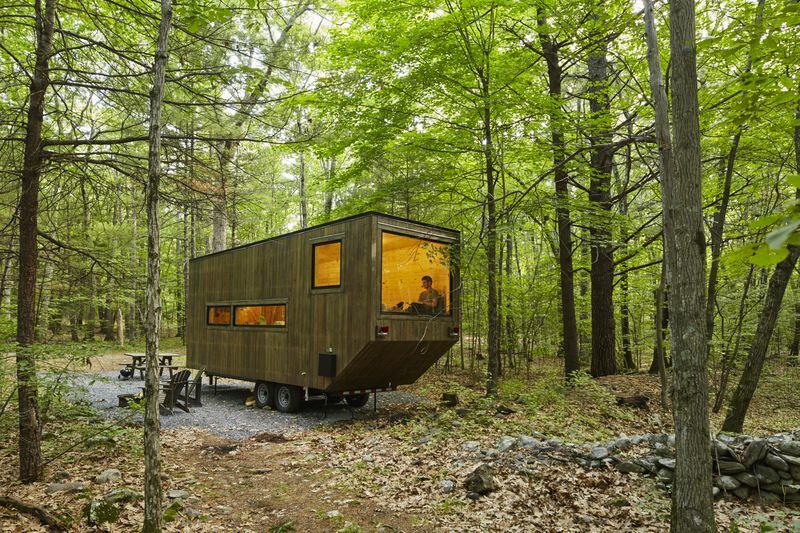 The company is also working on expanding to other cities, and creating a tiny house village. 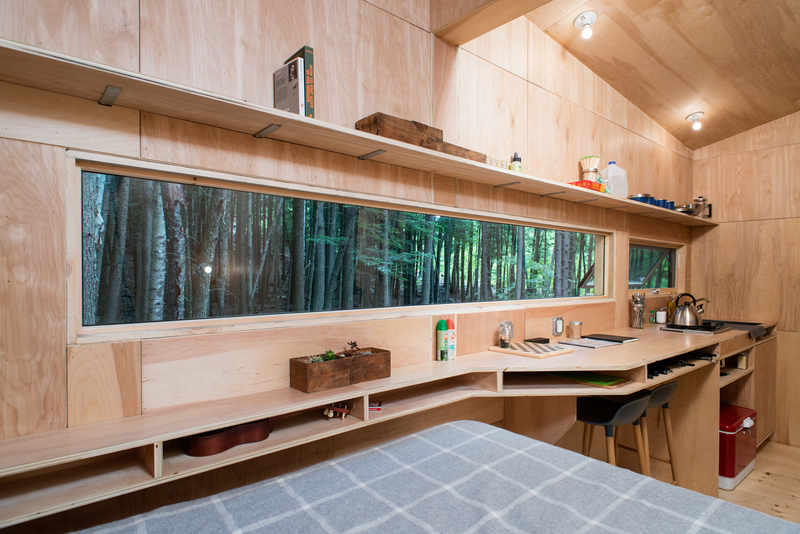 Each solar-powered cabin measures about 160 square feet and comes with a comfy Casper mattress, snacks, kitchen supplies, bedding and board games as well as a shower and toilet. 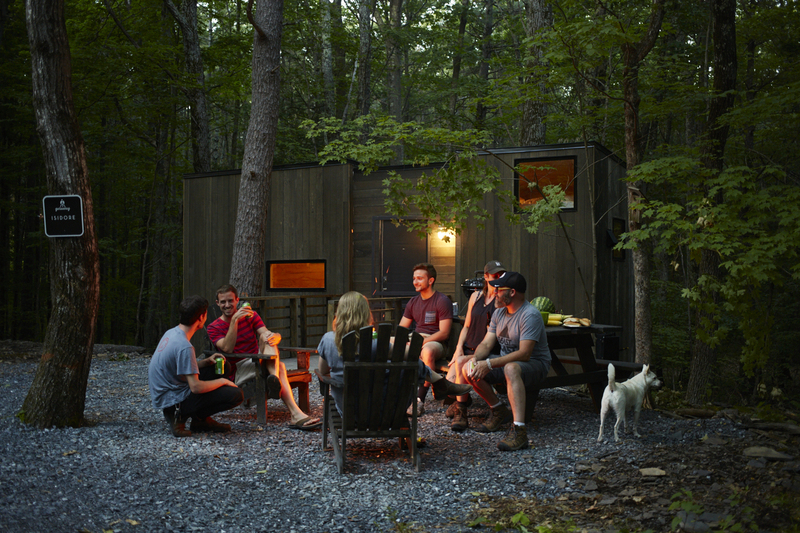 Some models feature lofted beds and some don’t; the Isidore sleeps up to four guests plus a pet, the Maisie has room for three, and Eleanor is ideal for a single or couple. 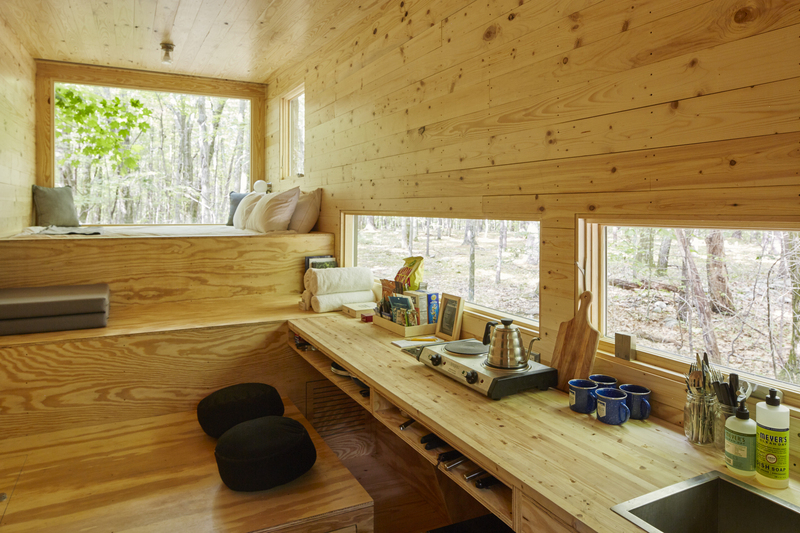 The Eleanor is pitched as a perfect retreat for creatives or just to complete a work project, and offers up a long desk surface looking out onto the scenery. You enter the home by keypad, so there’s no need to meet anyone for keys, and the cabins are far enough apart that you’ll feel relatively secluded. The exact locations are top secret – you don’t even find out what town your cabin is in until 24 hours before your trip. There’s minimal cell service and no wi-fi, encouraging guests to disconnect for the weekend. The startup is aimed at urban millennials, and chances are, the target consumers are used to living in cramped quarters already. The creators wanted to make quick vacations more accessible for people who can’t necessarily afford to go on a longer trip, and offer a way to decompress in natural surroundings. 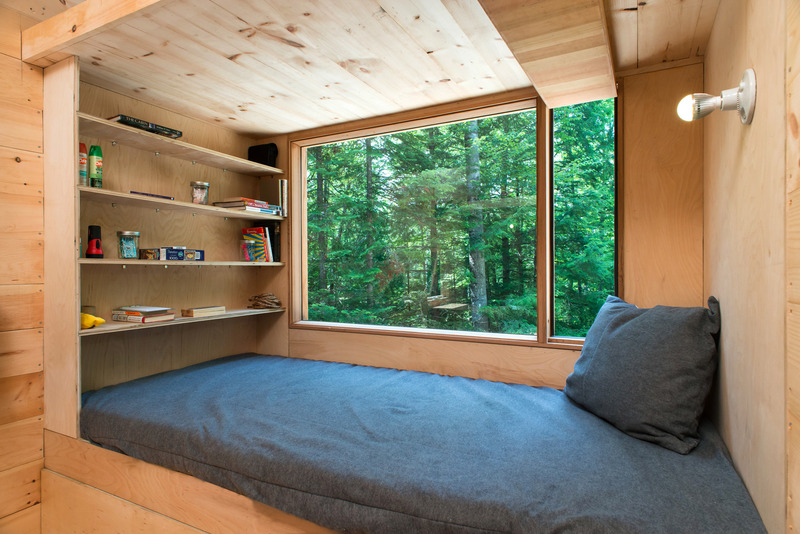 But it’s also a great way for anyone who’s caught the tiny house bug to see what it feels like to stay inside a home this small, and imagine their own belongings fitting into one.